First it was going to be outside in the street. The lectern was set up. The press pack were alerted. But it was only going to be two journos from the Beeb, one television camera and no questions. It was certainly not going to be a press conference. Then there was a technical glitch – they couldn’t get the power to the lectern. So everything was packed up and the lectern appeared again inside No.10, against a backdrop of oak panels. About 15 minutes later than scheduled, Theresa May dressed in a dark power suit, slid through the door and stood at the Downing Street lectern. This was her speech to explain to the nation why it was that the EU thoroughly humiliated her and the rest of the United Kingdom at their “informal summit” at Salzburg on Thursday. She was composed, calm, but still very obviously furious. Taken in isolation her speech was a good one. It was short – about 7 minutes – and said all the things that were necessary about respecting the vote and the difficulties of the Irish border and the integrity of the United Kingdom. There were little messages in there for the EU to read about having the ball in their court and having to come up with something workable for both parties. There was another little message to Donald Tusk not to rubbish your allies in public because it was bad manners, and so on. But what, really, was the purpose of this speech? And if the purpose can be divined, did it achieve its objective? To answer these questions as best we can, we need to look at the events leading up to her humiliation at Salzburg, and the cryptic signals emitted during her speech. Let us start with the signals. The speech would have been prepared in a hurry, but it was well crafted. Although she was reading it, Theresa May looked up at the camera at all the appropriate times – these will have been clearly marked on the paper. Looking at the camera is the same as looking at someone you are talking to – eye contact is essential to establish your sincerity. However, Theresa May has a way of half turning her head and then looking at a person or camera sideways. This is said to be an intimidating gesture – an evil one-eyed look – because the one eye now appears to be narrowed and triangular instead of round. She often combines this gesture with a kind of sinister half smile. This is the “death stare” that she is so well known for. This is the smile that says “I am smiling at you, but not in a good way. Your career is now toast.” May did this several times during her speech. It is unclear precisely who is the object of her ire (it may be Donald Tusk; it could be Angela Merkel; it might be Ollie Robbins) but whoever it is, he or she is clearly not her favourite bunny. But it also serves to let us, the public, know that she is very cross with someone in the EU. And this time, she really, really means it. Now let us consider the main events leading up to Salzburg. Whilst there has been a build-up of nearly two years to this event, the most significant single event was the production of the Chequers White Paper. The Chequers meeting was held on the 6th July when the entire Cabinet were incarcerated in a room – with Theresa May and Ollie Robbins as their gaolers. A particular feature of one of the dirtiest pieces of political chicanery in modern times, was that May bounced her intended option onto the cabinet – whilst rejecting, out of hand, the version prepared by DExEU. Having force-fed her option to the Cabinet, there followed a short series of resignations which served to consolidate May’s grip over the government. However, it soon became apparent that the Chequers White Paper was unacceptable to just about everybody, including the EU. Nevertheless, May forged ahead with the message that it was “my way and no other”. This meant that the entire UK negotiating approach was directed from No.10, using a template that was doomed to failure before it was even presented to the EU. Regardless of all the commentary and advice to the contrary, the opinion polls and the opposition of approximately 80% of the Conservative Party membership, May and her team steamed onwards into the night. The result was inevitable. The EU are adept at crushing their own members who step out of line – and that is exactly what happened to Theresa May at Salzburg. They said they would do it, and do it they did. She should have been prepared for it, if only because they allocated her a mere ten minutes after dinner. Ten minutes to put the case for the fifth largest economy in the world, and the second largest in the EU, to leave the bloc. Ten minutes to establish ways in which economic ties can be maintained without harming either side. Ten minutes to establish ways of maintaining borders whilst also preserving peace and sovereignty. That Theresa May went into this summit thinking she could pull off an agreement using a template that had already been informally rejected, was a piece of gross naivety on her part; and gross incompetence on the part of her advisors. But that is what happened. How did this sorry state of affairs come to pass? A landscape of fear is a concept in behavioural ecology and predator theory which describes the way that prey species alter their behaviour by moving out of high risk areas, to reduce of the risk of being killed and eaten by a predator. The high risk areas are described as the ‘landscape of fear’. But how is this relevent to Theresa May’s performance at the lectern? May’s ability to go nuclear in an instant is well known. Her death stares are a subject of comment. Her ability to cloak her intentions in secrecy are a source of frustration. Her track record of saying one thing in a well-received speech and then going away and doing something completely different, has completely eroded public faith in politicians. Theresa May is not only scary, she is extremely dangerous. The result is that the Cabinet appear to be too frightened to get into a meeting with May, have a full-blooded row and then simply refuse to co-operate until she sees sense. No.10 Downing Street is the landscape of fear, where cabinet ministers and officials alike dare not tell her the truth for fear of eruption. Instead, they are continuing to appease her and to feed her with whatever she wants to hear. There have been a handful of resignations – ministers who waited until they had left Chequers, so that they were beyond the landscape of fear. However the majority have simply altered their behaviour so that they are able to continue to graze on the lush pastures of power. They are keeping away from the predatory May as much as possible – thereby reducing the risk of foreshortening their political careers. At the time of writing, No.10 is reportedly still continuing on with yet another re-hash of the Chequers White Paper. Some kind of cobbled together, re-heated attempt to get the Irish Border question sorted is being mooted. Meanwhile, the rest of the world seem to be settling upon a Canada++ type free trade agreement, which is acceptable to most of the Cabinet and has already been successfully negotiated with the EU by Canada. It is also one of the options which will pass the critical test of being outside of EU jurisdiction and retaining command of our own destiny. In other words, it answers to the instruction of “Leave the EU” given by the referendum. But this, it seems, is unacceptable to Theresa May and she is blinding on with her own, private, preferred option of the Chequers deal. 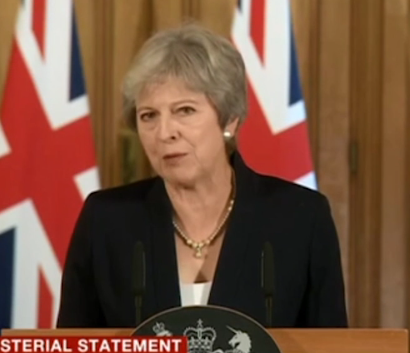 One final observation from that lectern – at the conclusion of her speech, May said: “I will not overturn the result of the referendum, nor will I break up my country.” Notice that she did not say “we” or “the Government” or “Parliament”. She said “I”. She is simultaneously turning herself into Joan of Arc – and thereby removing collective responsibility of the Cabinet and placing the decision solely upon her own shoulders. Not even Her Britannic Majesty Queen Elizabeth II uses the first person singular in a matter of such gravity. Not even Her Majesty would say “I will not allow this or that thing to happen.” And yet here we have a mere Prime Minister – a temporary incumbent of a great office of state; an ordinary politician; someone who can removed at the very next election by the whim of the electorate – saying “I will not allow….” When Margaret Thatcher became too autocratic, too imperious, too visibly affected by her enormous power, the Grey Men of the Conservative Party paid her a visit in Downing Street. Very shortly afterwards, she left Downing Street for the last time in an official car. It is time for the Grey Men to overcome the landscape of fear and pay Mrs May a visit. Kohl MT, Stahler DR, Metz MC, Forester JD, Kauffman MJ, Varley N, White PJ, Smith DW and McNulty DR (2018): Diel predator activity drives a dynamic landscape of fear. Ecological Monographs, 0(0), pp 1-15. Wiley Periodicals Inc.
You say Canada + follows the “instruction of “Leave the EU” given by the referendum.” Please remember, the referendum gave no “instruction” as to how to leave the EU: and it is one of Mrs May’s serious errors that she has treated it as having done so. There, we will have to differ. My view is that the £9million leaflet sent to every household in 2016 (sent to us in June 2016) superceded any legal advice given to Parliament in explanatory notes during the passing of the European Union Referendum Act 2015: “This is your decision. The government will implement what you decide.” In effect, there is a clear contract between the government and the electorate – an instruction, if you will.